God has told Noah a great flood is coming. 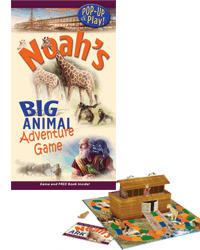 Noah has worked hard for many years with his family to prepare the great ark- a huge boat that God told him to build so they and the animals can survive. Help the animas avoid obstacles and find shortcuts to get to the ark on time! An exciting introduction to the Bible. Features non-denominational portraits of biblical characters as caring, understandable humans facing extraordinary situations: Abraham and the Idols, The Story of Ruth, Noah and the Ark, Queen Esther, David and Goliath, David's Dance, Wise King Solomon . . .